Fortnite is one of the most popular online battle games. This game is available on different platforms such as Android, iOS, PC, Xbox, PlayStation and Nintendo Switch. Besides, gamers are comfortable to play using their mobiles devices since it is very easy to carry. Meanwhile, there are times that they may need to record Fortnite gameplay on mobile to share some strategies on how to survive and win this game. Let’s find out useful ways to record Fortnite gameplay. The eleventh major operating system of the Apple mobile devices comes with the built-in screen recording feature. This feature is available on iOS 11 and later. With this, iOS users can easily record the screen of their iOS device without installing any application. It enables you to capture the gameplay of your favorite online games like Fortnite, Rules of Survival, Mobile Legends and a lot more. In addition, it can record microphone audio and system audio. Here is the procedure on how you can record gameplay using this technique. 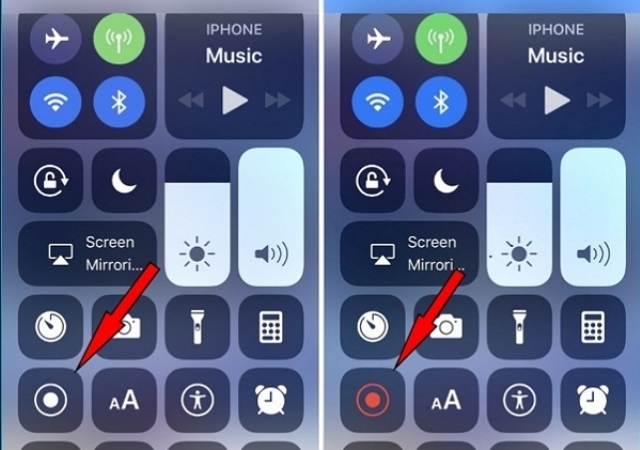 Go to “Settings” > “Control Center” > “Customize Controls” > “+Screen Recording” to add the built-in screen recorder to the Control Center. Open the “Control Center” on your device and tap the “Screen Recording” icon to start recording. If you want to record the microphone audio, simply press the “Screen Recording” button and tap “Microphone”. Once done, go back to the Control Center and tap the “Screen Recording” icon to stop. 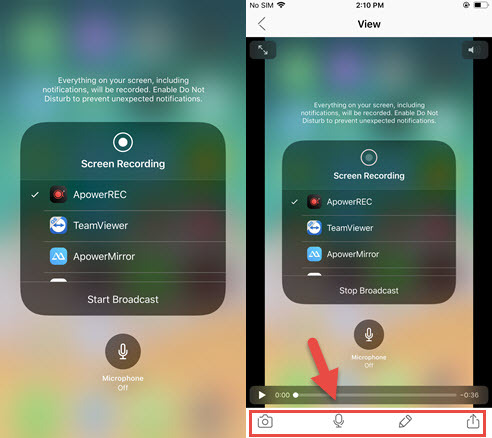 An alternative screen recorder for iOS device is ApowerREC. This is a free application which can record Fortnite on iOS and other activities on your device. It can be used to capture video streaming, web pages, video calls from your loved ones and so on and so forth. Recorded files can also be shared to your friends online. Follow the steps on how this program works. Visit the App Store on your phone and search for the name of the app and install it. Or you can get it installed from below. Run the app, and then open “Settings”. Go to the “Control Center” then “Customize Controls”. Afterwards, tap “+Screen Recording”. Once added, open the “Control Center” and firmly press the “Screen Recording” icon. Select “ApowerREC” then “Start Broadcast”. Now you can start playing Fortnite. When you are done, go to “Control Center” and press the “Screen Recording” icon then “Stop Broadcast”. After saving the game recording, you can playback the video. From there, you can access more features. If you are willing to add your face or voice to the game as commentary, you can then tap the microphone and screenshot-like icon to do this trick. Plus, you can also make use of ApowerREC to trim unwant parts of the video. If you are an Android user, you can use ApowerREC app which you can get from the Google Play Store. Just like the iOS devices, this is a free screen recording app which can help you to record your Android’s screen. Besides, this is a perfect program to record gameplay since it can record internal audio and device’s camera. With it, users can create instructional videos of the game. Furthermore, it supports portrait and landscape recording. 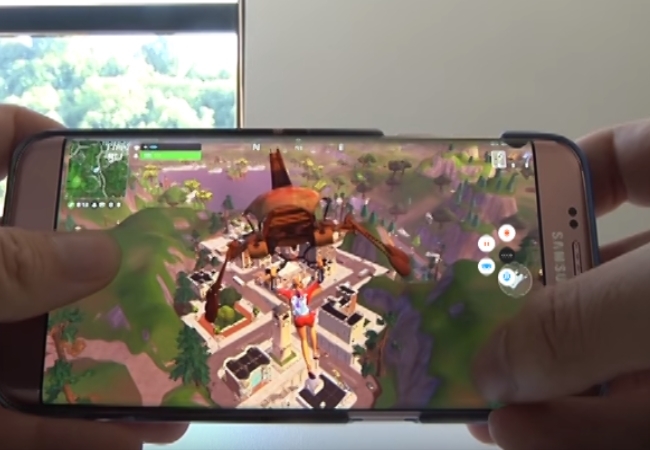 To record Fortnite on Android, see the guide below. Install this app on your Android phone then launch it. Tap the record button, and then select recording mode and tap “Start Now”. After that, start your game. Once finished, open the app again then tap the stop button. If you enable the overlay function, simply tap the overlay icon then “Stop”. Another screen recorder for Android mobile phone is DU Recorder. This application has a simple interface that can be used by everyone. It lets you record the screen while playing games, making video chats, watching videos from your favorite video sharing sites and many more. In addition, it allows you to take a screen capture and edit the picture right away. Below is the process on how to capture Fortnite gameplay using this application. Go to the Google Play Store and enter the DU Recorder and hit “Install”. Open the app once installed. Hit the video-like icon on the main interface of the app then tap the “Start Now” button. Open the Fortnite game app on your phone then play. If you are done, swipe down the task bar, and then stop the recording. As a game enthusiast, it is a great help if you share your tactics with others on a certain game. On the other hand, players can record their gameplay with the aid of the given techniques above. Also, they can share it with other people who have the same interest. All of these techniques are professional and free of charge on how to record Fortnite on mobile. You can try them all and pick the best tool. Rating: 4.8 / 5 (based on 36 ratings) Thanks for your rating!